Speedo's first infant mask uses Biofuse® technology, offering cushioned comfort and easy adjustment, so little ones can concentrate on having fun in the water. Biofuse® products mould to the shape of your body for a cushioned comfort fit. Speedo Junior Sea Squad Mask Goggle is rated 3.5 out of 5 by 10. Rated 5 out of 5 by insertcoin from Great googles for small kids My daughter has been testing these googles in the last 2 weeks and seems to work as expected. She is 2 years long and the googles adapt perfectly. The swimming classes are 45 mins and the googles seem to be comfortable for such a time. Sometimes i have seen that they do get a little bit foggy but not too much. Rated 3 out of 5 by Roy156 from good goggles but very small fit nice product with a smooth strap and quality finish covers. only concern bought for 3 year old and they was only just fitting him. 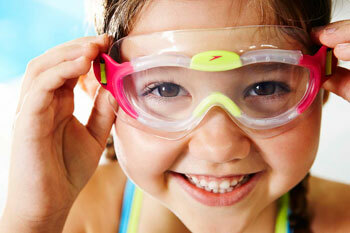 Rated 5 out of 5 by Tomifi1 from Swimming goggles for a 2 yr. old Perfect 1st swimming goggles for a starting swimmer. I recommend these "open-water" type goggles as opposed to the traditional type, because the young child much prefers having a wider view and scope and doesn't rellay want the pressure on the eyes that the traditional type of swimming goggles might give. Great product! Rated 1 out of 5 by ChrisO78 from Total of a let down Bought these for my eldest son a while a go as he didn't like the normal goggles pinching on his nose or being too tight and putting pressure round his eyes. Problem 1 the mask It doesn't spread the load much round the edge of the mask, we had to have them quite tight to get a seal round the mask, which caused quite a bit of pressure on the bridge of his nose. Problem 2 the strap Maybe my son has a small head, but we had to have these adjusted as tight as they could for them to fit, which we initially though would be fine as he grew we could let them out. However the neoprene strap just stretches and loses elasticity over time (quite a short time at that even with taking great care in rinsing out pool chlorine and sea salt from the strap). The mask is now way too small for him (he is now 6), the strap is on it's tightest setting and it is not tight enough. Problem 3 the cost I don't mind paying for quality particularly for kids but this isn't it have replace with a speedo junior anti-fog, tinted, conventional goggle for half price with a much better fit, his little brother (age 3 1/2) also can wear them with no problem, but now has his own very basic Crane goggles at a 1/6th of the price. At a 1/6th of the price I don't mind cutting away the excess from the nose bridge after adjustment and getting a new pair in 6 months time when these don't fit.